You are here: American University Kogod School of Business News Creating Creativity. Fostering Grit. Vivek Narain, KSB '99, believes in the power of creativity. He wants to foster communities that are vibrant and progressive - places where people can explore new ideas, big and small. This is what fuels innovative businesses, he says, and the entrepreneurs that create them. "I think there's a creativity deficit in the world-and it's a really important part of everything that we do," Narain says. "We've got to find a way to stay engaged with ideas that are important to humanity and to life." 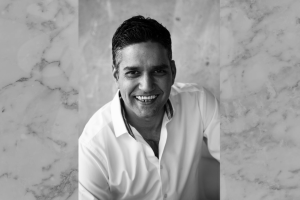 This passion is what led him to found the Quorum, a New Delhi-based lifestyle club, which opened its doors this Spring. The Quorum offers members an integrated work and social space centered around culture, complete with a co-working space, a dining area with a bar, a fitness studio, and arts-focused events. It's a space where different types of people can come together - for work, and for play. The community is designed to cultivate interesting conversations that Narain hopes will encourage impactful entrepreneurial ideas. He was inspired to create the club when he noticed creative work-social spaces popping up in cities around the world - but not in India. "I wanted to bridge the gap by creating a similar community here in New Delhi," he says. Narain, whose background is in banking and hospitality, leveraged his varied business skills to found the organization. "My combination of experience in finance and the hospitality industry created the 'perfect storm' for me to create the Quorum." Before starting the Quorum, Narain worked as Director of Development for Fairmont Raffles Hotels International, helping the company grow their capital and manage their finances. He also was Acting Vice President of YES Bank, a start-up in India that he helped build from scratch. The experience gave him a thirst for business development-what Narain calls "entrepreneurial zest." Prior to building his career in India, Narain was in banking on Wall Street, where he worked several years after leaving American University. "It gave me a strong foundation I could use in any type of business I went to," he says. Of all the lessons he's learned, Narain says the most important is the meaning of "grit." Creativity is essential, yes, but without perseverance and willpower, he would not have succeeded, he says. "I'm proud of where I've gotten. And hopefully my passion for the work will continue to speak for itself." Moving forward, he plans to continue growing the Quorum - and fostering the creativity and grit he needs to do so. He aims to create meaningful change in the business world, giving people a place to nurture their aspirations. "I'm not sure where my path is headed, but I will certainly keep at it. If I can make an impact, even in a small way, then I've done my job," Narain says. Learn more about the Quorum and Kogod's programs.